Val Lewton's penultimate horror production for RKO, Isle of the Dead, is one of the producer's weakest works. There are, as usual for Lewton, some intriguing ideas at the core of this film, but it's weighed down by a messy script and often shoddy execution, particularly in the brisk, confused pacing and jumpy editing that skips abruptly from scene to scene. 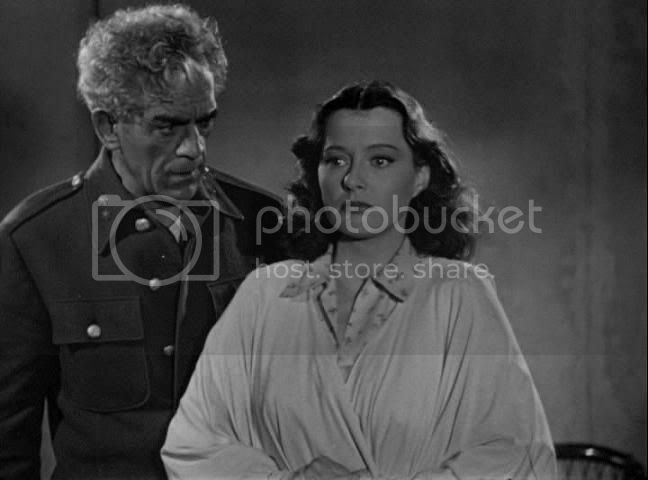 This is especially true of the film's expository first half, in which the tough, uncompromising Greek general Nikolas Pherides (Boris Karloff) and the American newsman Oliver Davis (Marc Cramer) pay a nighttime visit to an island where Pherides' wife is buried. The opening establishes Pherides as a cold, brutal leader — he punishes one of his commanders, whose troops were delayed during that day's battle, by handing the hapless man a pistol, a silent signal that he should go kill himself, which he obediently does outside the general's tent. Davis' attempt at critiquing the general soon morphs into good-natured banter, perhaps because the bland Cramer isn't capable of getting any of his lines out, throughout the film, without a misplaced grin and a cheerful lilt in his voice. He manages to make every scene he's in seem like a comedy. To make amends, Davis offers to accompany the general to his wife's grave, and the two make a brief journey by boat to the cemetery island (guarded by a gruesome statue of the three-headed dog Cerberus). Once there, however, they find that the grave has been desecrated, the coffin open and the body missing. It seems like the film is setting up a creepy ghost story or zombie tale, but the mood of slowly encroaching terror is cut short by Pherides' incongruous reaction — basically, "she's not here, oh well, let's go back" — and the fact that this whole curious incident is barely ever mentioned again. The script is riddled with these kinds of odd holes and tonal discontinuities, moments where the only possible reaction is nonplussed confusion. In fact, Pherides and Davis only wind up staying on the island because they hear haunting singing from far away, and they follow its sound, drifting on the wind, back to a house where the archeologist Albrecht (Jason Robards, Sr.) lives with several guests. 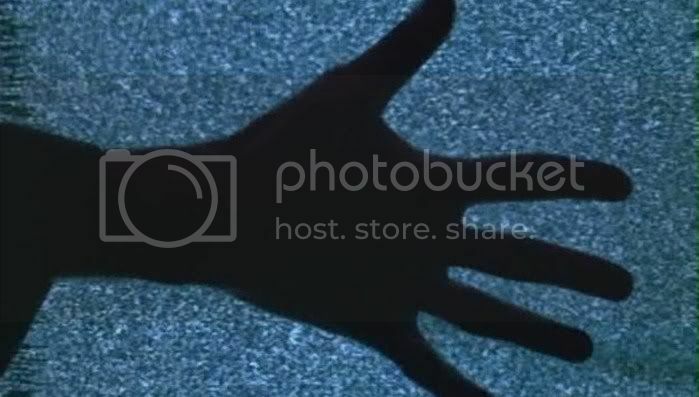 They wind up being trapped there, however, when they discover that one of the house's residents has died of a virulent plague, and that everyone else may be infected. Unable to leave lest they spread the disease on the mainland, they all settle in to wait out the plague's course. The inevitable supernatural element comes only in the form of the grave pronouncements of the housekeeper Kyra (Helen Thimig), who insists that the disease is being spread because of the presence of an evil spirit in the house. Specifically, she is fixated on pretty young Thea (Ellen Drew), the nurse to sickly Mrs. St. Aubyn (Katherine Emery), who was convalescing from an incurable illness even before arriving at the island. Kyra sees the older woman wasting away, growing paler and weaker every day, while Thea remains active and rosy-cheeked, and believes that the younger woman is sucking the life from her patient. As the plague slowly thins the ranks of the house's guests, Pherides, formerly a staunch defender of rationality and science, is won over by the force of these superstitions, and comes to believe that in order to stop the plague he must destroy Thea. These is compelling raw material for an atmospheric B movie. Lewton, always interested in digging beyond the surface-level scares of most horror, finds in this story an extended debate between science, religion and superstition, all of them posited as alternate ways of coping with and understanding mortality. Pherides is also an interesting symbolic character, a man who believes he is doing good but who commits horrible acts in the name of noble causes. Just as, earlier in the film, in patriotically defending his homeland he drives a man to his death for a minor offense, once on the island his desire to protect those around him brings him to the brink of murder. The film's thematic foundations — the ways humans confront and think about death, the horrors perpetrated through good intentions — are strong, and by all rights this should be another of Lewton's powerful, subtle horror dramas. But its script and uneven pacing sabotage it at every turn, and its themes are treated with a complete lack of nuance. The debate over religion versus science is presented only in the most simplistic of terms, in scenes whose rhetorical points are patently obvious. Moreover, with the exception of Ellen Drew's conflicted young innocent and Helen Thimig's witchy, fiery-eyed old housekeeper, the cast is abysmal and the dialogue is flat and deadened. Whole scenes play out where everyone seems to be reading from cue cards — or perhaps trying to read them, squinting at words too far away to read properly, slowly sounding out what they think they're supposed to say. Even the usually dependable Karloff seems lost, as though he stumbled onto the wrong movie set and got trussed up in this general's costume without any idea of what he's doing. There are moments where his energy and intensity comes through in the hard set of his jaw and his gruff manner, but more often he simply wanders through the movie without purpose. No one else is especially great, but Robards and Cramer are particularly awful, with the former stagey and pompous, and the latter simply smug and ineffectual. The problem is exacerbated by the sheer variety of performances on display: everyone seems to be in different movies, most of them rather bad movies from the look of it. Cramer's good humor rubs uncomfortably against the monster movie mugging of Karloff and Thimig, or against the sweet, low-key subtlety of Drew, whose character is inexplicably expected to fall in love with Cramer's Oliver. That brings up another problem with the film, namely that for a group of quarantined people trying to survive a deadly plague, nobody seems to be making much of an effort to avoid contact with one another. Not only do Oliver and Thea meet illicitly in the woods to make out, but Thea spends the night in the room of a plague victim — and doesn't get ill, for some reason — while everyone else wanders around freely, chatting and hanging out as though on vacation. There's no sense of urgency, no consistency to how the disease spreads or who gets sick, no real tension. Lewton and director Mark Robson save most of the film's horror for a handful of effective set pieces towards the end, nearly redeeming the film by belatedly injecting some formal interest into the proceedings. This despite the fact that many of the effects in the ending sequences are achieved without any overt visuals whatsoever, instead weaving dense aural tapestries. In one scene, Thea locks herself in her room with the ailing Mrs. St Aubyn, while from outside the door Kyra taunts and cajoles her, her sing-song chants slowly driving Thea to despair and terror. There's also a remarkably effective sequence of a woman being buried alive, which Lewton and Robson signal entirely with the sounds of her struggle inside her coffin: amplified scrapings and scratchings, the creepy noise of fingernails screeching against wood. 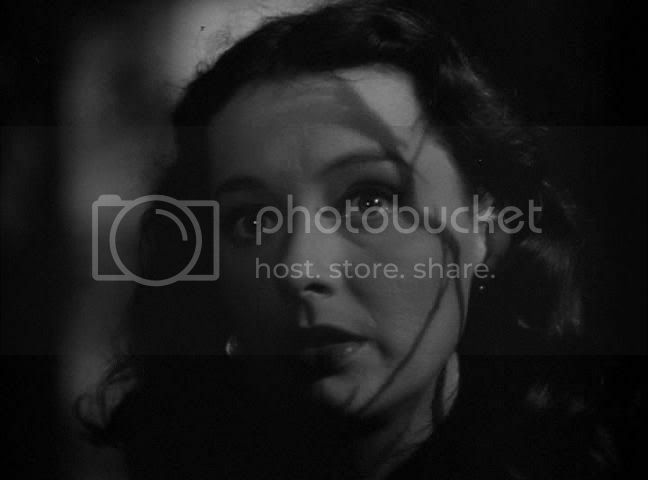 Scenes like this, and the eerie shots of Thea wandering around the dark island with the clawed shadows of tree branches written across her face, indicate the possibilities of what this film might've been if it was a peak Lewton production. As it is, despite these flashes of the old Lewton touch, as a whole Isle of the Dead is dull, uneven and sloppily constructed. The film's terrifying centerpiece, which is a tour de force of sight and sound (and you stated this of course in the final paragraph here) concerns the premature burial of a cataleptic, played by Katherine Emery, who is thought to the latest victim of a plague that is felling this small group on a Greek island. After she is pronounced dead, the camera moves in to show the audience what the other characters have missed--the quiver of her nostrils. Once emtombed in the crypt, she is heard howling in a bone-chilling collaboration with the tapping of water drops on the outside of her coffin, and a fierce wind blowing outside the vault. It as arresting a moment as any ever to be experienced in any Lewton film (or any film, period) as it perfectly conveys the essence of the worst fear known to mankind: that of being buried alive. As you noted, there is also a most effective transitional image (recalling the figure of St. Sebastian in I WALKED WITH A ZOMBIE) of Cerberus, and some engaging folklore context about the vampire-like 'vervolakas' and the characteristics of the plague and the 'sirocco' winds. Again, I agree that only the two performers you mention survive of this lamentable cast. Karloff sleepwalks throughout, and he delivers one of his worst performances after his late career low in VOODOO ISLAND, but curiously and inexplicably he had delivered what may well be his finest performance ever the same year in Lewton's THE BODY SNATCHER. The script is wooden and (again as you astutely and eloquently point out) is rather ludicrous. It would be interesting to know what Lewton's discarded script was all about, but it surely would have eclipsed this by a distance. Still, I have a fondness for this film, mainly for it's sustained atmospherics throughout and that masterpiece sequence. I watched it many times as a child when it ran on syndicated television long before the advent of television. Your superlative review is the most exhaustive ever written on the film that I've ever seen. I look forward to your review of BEDLAM, ,which also is problematic in my opinion, but not the same issues as here. I agree - not one of Lewton's strongest. My favourite has to be The Leopard Man which is equal to Cat People in style, atmosphere and the extent to which it can mess with your mind. Just discovered your blog by the way, and I love it. Hello CMS. In the spirit of enriching discourse (and not at all to step on Ed's feet as he has given this whole series definitive treatment on these pages, not to mention this is his site) I found THE LEOPARD MAN rather uneven, even if several sequences (like the buried alive passage in ISLE)ranked among Lewton's finest....i.e. the unseen mauling of the young girl against the door by the leopard, and the blood oozing through the crack, and of course the train sequence where the leopard's eyes are seen in the darkness. But much like 1945's THE SPIRAL STAIRCASE, the killer is known fairly early on. I think Leopard Man is quite good, but not one of my favorites. The ending is really unsatisfying, but on the other hand the atmosphere is wonderful, and I love its meandering plot, the way that, despite its short length, it seems to have plenty of time to hang out with its various characters. Its treatment of class and poverty is also quite interesting. But the best Lewton films, IMO, are the obvious ones: Cat People, I Walked With a Zombie, Curse of the Cat People. I couldn't pick between those three.